In the Early Modern Irish tale, “The Fate of the Children of Tuirenn”, Lugh prepares to take on the might of the Fomoire hosts, seemingly single-handed. 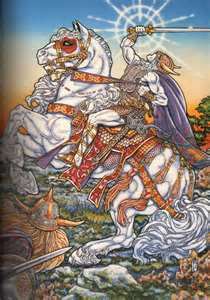 But he will need some very special weapons for this task, along with the help of Clann Manannáin, the “Fairy Cavalcade”. As this epic “Sorrow of Irish Storytelling” serves as one of the few texts telling the story of Moytura, our discussion has been split into two full episodes. First of all, great to see this being posted. I only started listening to these when you were halfway through the Moy Tura posts to date, and I only got caught up recently, so I was looking out for the latest one. I hope you can keep them coming for a long time to come. I can’t say how much I’m enjoying these podcasts and all the supplementary materials. We Irish folk get lots of tales of Fionn McCool and Cuchulainn growing up, but not so much of this ‘Tuatha De Danann’ stuff. The only place I was exposed to these story elements before was in Pat Mills’ Slaine stories in 2000AD. It’s fascinating to finally experience the source materials he based much of it on. I had a hoak around the internet for an English translation of the current text and the one at the following link seems to be the best. I can’t say how good the translation is, but it seems to include all the elements you mention in your discussion. It’s a translation by ‘Cross and Slover’ from 1936 if that means anything? All the other translations I’ve found leave out much of the introductory paragraphs dealing with the build-up to the Battle of Moy Tura. Having read to the end, the introductory Moy Tura stuff might be the best part. Anyway, I might have a few questions about your earlier posts. Would there be any point in putting them inthe comments section of the relevant posts, or should I send them in an email or what? Different sites do things differently I know. Thanks again for these wonderful discussions. These are all very rich materials that should be more widely known, and you are doing great work in making them more accessible. Thank you so much for your kind words, and for reminding me that I hadn’t posted the link to the version of the text we were using! I’ve updated the main post to include the link… Phew! I’m glad you’re dipping into our back catalogue. It’s up to you whether you’d like your comments to be public, like this, or private in an e-mail or via the “Contact Us” link. I’d quite like more public discussion on the site, as we’ve often been pointed to really useful material by our audience. The spirit of Story Archaeology is that of discussion and exploration, and we certainly have no monopoly on that! I hope you continue to enjoy our materials, and feel free to add your own comments, questions, research and theories!